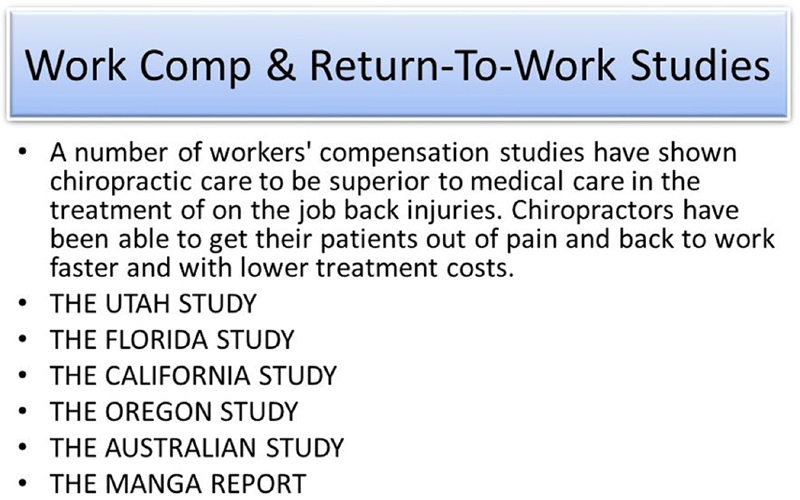 Conclusions Differences between when the two Coordinator activities were effective may be due to the nature of claimants who RTW in each survey period. Length of shorter-duration claims are influenced by injury related factors, while psychosocial factors tend to be more important for longer-duration claims. Such factors may determine whether a claimant is more likely to respond to Coordinators’ functional or interpersonal activities. The findings have important implications for increasing Coordinator effectiveness. In 2010, an estimated 313 million people worldwide experienced an occupational injury or disease requiring at least 4 days off work, with a total estimated cost of 4% of global GDP. Time off work due to injury is associated with poorer physical, mental, and social health outcomes, while good quality work — even for those who are ill or recovering — promotes recovery, improves health, and reduces the negative effects of long-term work absence. [2-5] We investigated whether workplace-based return-to-work (RTW) Coordinators can reduce the burden of occupational injury by improving the likelihood of RTW among injured workers. Throughout North America, Europe, and Australasia, Coordinators manage injured workers’ transition back to the job [6, 7] and are regarded as an important component of successful RTW interventions. [8-10] Known by various titles including rehabilitation coordinator, injury management coordinator, and case manager [11, 12], their common feature is management of the RTW process through workplace assessment, RTW planning, and fostering communication, negotiation, and conflict resolution between injured workers, employers, and other stakeholders. [7, 8, 11–14] Coordinators may be located in the workplace, a government agency, hospital or other healthcare organisation, or be an independent consultant. [6, 7] Interventions that include a Coordinator have shorter disability durations, lower costs, and may improve functioning and quality of life. [8, 9, 15] A recent Cochrane review of 14 randomised controlled trials suggested that compared to usual practice, Coordinators do not improve RTW outcomes. However, the studies in the review were rated at low- to moderate-quality and did not account for different Coordinator activities, which may be an important factor in their impact. For instance, recent research suggests that both management and interpersonal skills are essential for success in the Coordinator role [6, 11, 14, 17], but to our knowledge their impact on RTW outcomes has not been quantitatively assessed.